Following the announcement of his forthcoming debut album Konfidence, due on June 25 via KAR Records/AWAL, and the release of its lead single ‘Dance All Night’, which has been met with rave reviews and much acclaim, fast-rising London singer, songwriter and musician, and BRIT School alumni KIT RICE follows up with a brand new offering titled ‘Just A Kiss’, premiered via CelebMix, the second single from his Konfidence album. Coming on the back of recent support from BBC Radio 1, Music Week, Kiss FM, Capital Xtra, BBC 1Xtra, Complex, MTV UK and Digital Spy in recent years, Kit Rice has started 2018 in spectacular fashion – first with ‘Dance All Night’ and its UKG remix from longtime collaborator and UK Garage veteran DJ Fen, which have been supported by the likes of Fame Magazine, ILUVLIVE and UMA Music, among others. 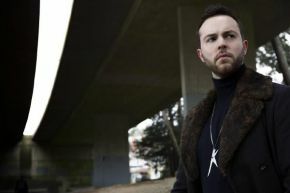 Beckenham native and former The Voice UK contestant Kit Rice continues his streak with his brand new single ‘Just A Kiss’, which was written and produced by Kit himself, with Nigel Walton, who has worked with Basement Jaxx, Krept & Konan and Bloc Party, mastering the record. The piano-led ballad is a complete detour from the groovy funk of ‘Dance All Night’, but it perfectly showcases Kit’s amazing vocals and songwriting, which carry the record throughout. According to Kit Rice, ‘Just A Kiss’ is “vocally inspired by the power ballads of the 90s but flipped for 2018! This album is very synth intensive compared to my earlier music, and this is highlighted on this song. The song tells that age old story of two people connecting instantly; love at first sight. The kind where you can’t stop talking until 3am and time flies by in an instant. This album tells a story and ‘Just A Kiss’ carries on where ‘Dance All Night’ left off”.